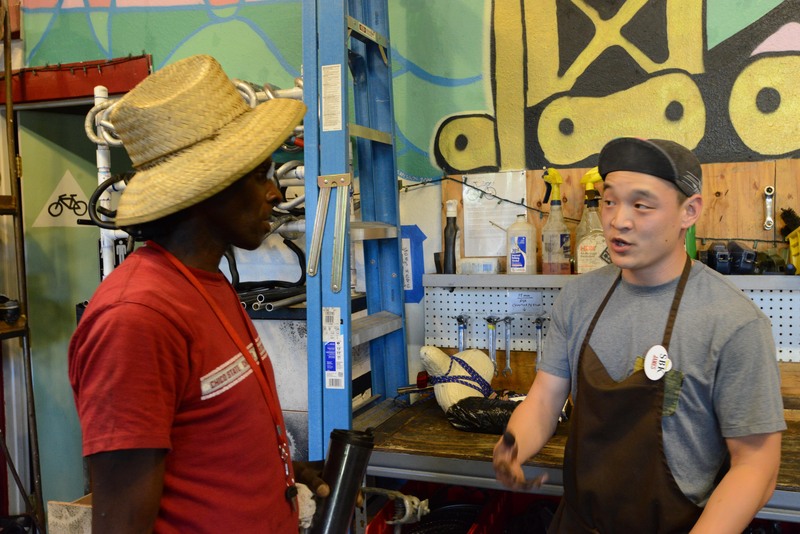 The Sacramento Bicycle Kitchen (SBK) is run completely by volunteers. We have a regular, committed staff that contribute at least 3 hours a week. We also have many, many people that contribute their time and skills occasionally. Without both of these types of volunteers we would not be as successful as we are. Come to an orientation and learn more about how you can contribute– you don’t need to bring anything but yourself! SBK is always interested in new volunteers! Volunteer Orientation is held every 3rd Monday of the month at the shop! Orientation begins at 7pm! Allow 1 hour for key orientation topics, but may run longer depending on group size. Come wearing rags because you may be asked to get your hands dirty! RSVPs are appreciated but not necessary. No previous bike shop experience necessary; just be willing to learn! You must be 18 or older to volunteer; minors may volunteer at the discretion of the Volunteer Coordinator and daily shift manager. Minors must bring a parent or guardian to orientation to co-sign the liability waiver. Email our Volunteer Coordinator if you have any questions or to RSVP! Read more about our volunteer levels and organizational structure here.